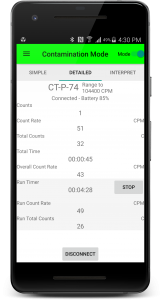 All our CT007 series radiation detectors can wirelessly connect to our GammaGuard app. 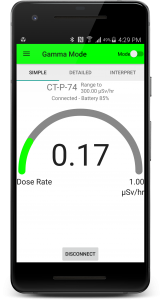 The CT007 series radiation detectors are sophisticated sensitive radiation measurement instruments and can be wirelessly connected to GammaGuard for enhanced functionality. > Provides a large, easy to read display. > Has the ability to interpret readings for non-technical users. > Uses one consistent user interface across all CT007 series detectors, so that there is only one system to learn. > Can automatically save data to a file and upload data to a central database, facilitating coordinated incident response. > Will run in the background while performing other tasks. 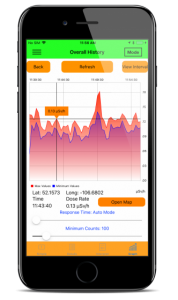 > Alerts the user to elevated radiation levels, even when performing other tasks and GammaGuard is running in the background. 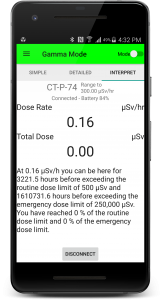 > Displays the radiation level when the CT007 detector is up to 40 m away from the smartphone. > Changes background from green, to yellow, to red, to indicate low, elevated, and high levels of radiation. *These features will be available on both Android and iOS systems soon. 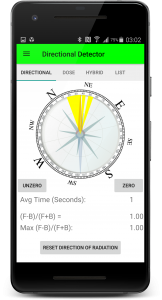 GammaGuard is available on the Apple App Store and the Google Play Store. Note: There is a bug in Google Play Store search algorithm so that "GammaGuard" can't be found as a result. Please use the link above to find and download GammaGuard on Play Store.